2Marine Science , Faculty of Science, Suez Canal University, Ismailia, Egypt. 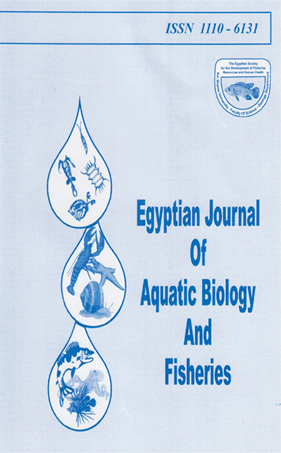 The food and feeding habits of the Egyptian Sole, Solea aegyptiaca (Chabanauad, 1972) were studied in Port Said area, Mediterranean Sea during the period from October 2004 to September 2005. The annual composition of the diet, the intensity of feeding, seasonal variation of diet composition and variation of diet with length, showed a low-intensity of feeding activity of S. aegyptiaca, and indicated that they feed on a wide variety of prey types (polychaetes, mollusks, amphipods, sediments and small quantities of crustacean fragments, Ascidia, fish parts, sea grasses, brittlestars, unknown medusae and algae), with a limited variation in diet among seasons. The prey types and size differed from juvenile to adults, juvenile ingested only 5 small prey items; while adult had eaten about 11 of large sized prey items. The diet composition of Egyptian sole is indicative of a generalist feeding strategy.